Photography by Viona Ielegems and poetry by Theodora Goss were featured in the latest issue of Faerie Magazine. I included mainly recognizable fairy tale photographs in here, but Viona's site has many more fairy and fantasy inspired shoots, often dark and creepy. I just recently listed a few reasons that mothers in fairy tales are villainized, historically, but I had another thought. I don't know much about postpartum depression, but 10-20% of women are estimated to have clinical depression after giving birth. These women will have negative feelings towards their baby, sometimes wanting to hurt them: "when a woman with severe postpartum depression becomes suicidal, she may consider killing her infant and young children, not from anger, but from a desire not to abandon them." Most women never act on these thoughts, but some women, like Andrea Yates and Susan Smith, killed their children because of this condition. In fact, according to this article, over 200 women a year kill their own children in America (!!!). Even after the average birth, it's common to experience some form of "baby blues," emotions or sadness that go away after time. But 10-20% is pretty high-anyone who knows 10 mothers most likely knows at least one person who experienced postpartum. It's a pretty strange thing to try to wrap your mind around, especially for those of us who have never given birth. Even today, when we are aware it's a serious medical condition, it's hard to understand what these new mothers are going through. How much more so hundreds of years ago? The mothers going through this would have really seemed like monsters if they tried to explain their feelings. So many fairy tales are about mothers acting violently towards their children-remember that in older versions, Snow White and Hansel and Gretel were abandoned by their birth mothers, not stepmothers; but many other fairy tales, like Cinderella, Juniper Tree, Wild Swans, etc., feature abusive and/or murderous mothers. Maybe some of these stories came out of/were considered helpful for the fathers and family members who witnessed a mother experiencing inexplicably violent wishes towards her baby? Or maybe the stories were ways that the mothers themselves could vicariously fulfill their own desires without actually acting on them? I don't think I've ever read anything connecting postpartum to violent fairy tale mothers, although if it really occurs so often, people throughout history would have witnessed mothers they know going through this, and it makes sense that the stories would help the different people involved start to process through the experience. Although we can only speculate as to the intentions and beliefs of older cultures who told fairy tales, we do know that fear of witches and werewolves were widespread for many years in parts of Europe and America. I had mentioned earlier that the reason most of these supposed witches and werewolves confessed was because they were tortured until they did so; but I came across another theory. 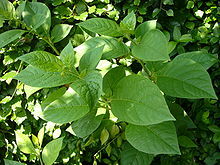 Some people think witches used the plant belladonna. Lethal in large doses, in smaller doses it causes hallucinations, and especially in combination with other plants such as opium makes a flying ointment that makes you feel like you're floating through the air. 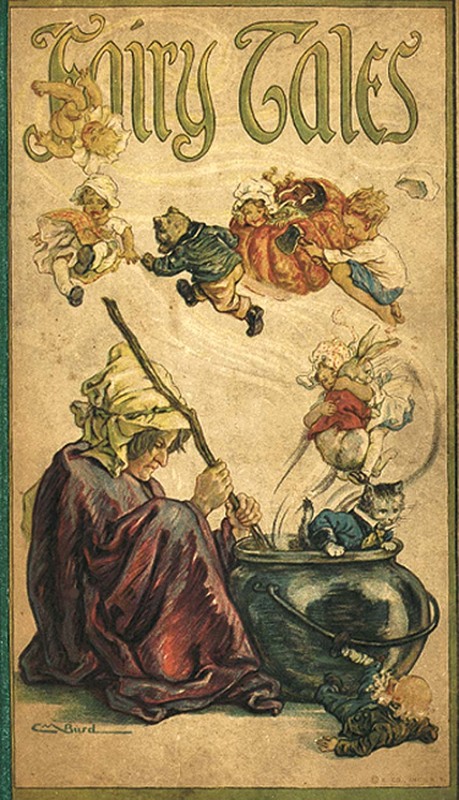 Witches would use the ointment before flying on their brooms-traditional witch folklore holds that they would fly at night to their festivals/pagan sacrifices/Witches' Dances. Also reminds me of reading about toad licking in association with "Frog Prince". Another way to get psychadelic visions, some people think this phenomenon could have led to the image of kissing a frog and seeing a handsome prince where none was before; however, the kissing scene of Frog Prince is only a recent phenomenon. But it still may account for the presence of frogs in fairy tales as transformative animals. By the way, be sure to check out The Case of the Missing Kiss over on Quill and qwerty if you haven't already-a very interesting and well-researched look into Frog Prince tales and the addition of the kiss, as opposed to throwing the slimy animal against a wall. If anybody else would like to participate, I officially tag you! I love hearing stories of how fairy tales interact with us in our daily lives! Andersen's "The Little Mermaid" is the most well-known Danish mermaid tale, although that was based on literary French stories. So it's interesting to compare this famous story with other tales that have been recorded around the same time. 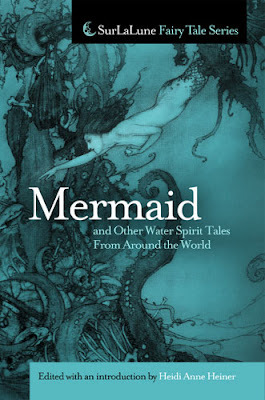 These are from Surlalune's Mermaid and other Water Spirit Tales From Around the World book. "Agnete and the Merman" by Jens Baggesen is a creepy and tragic tale. It tells of a merman who comes from the sea, professing his deep love for the human Agnete (a gender reversal of the Melusine/Undine/Little Mermaid stories). She loves him too and agrees to go down into the sea with him; they live for two years happily and she bears him two sons. But Agnete hears church bells coming from land and desires to go back; she promises her husband to return by morning. She follows the midnight church bells and sees her mother. Her mother pleads with her to come back to land; she has abandoned not only her parents by joining the merman, but her two human daughters. Agnete claims she must go back to her new family, but then she is told that her father, after searching for her in vain, killed himself; the church bells she had heard were for his funeral. She then turns around and sees her mother's name on a grave-time passes differently under the sea (as it often does in Faerie) and the conversation with her mother was either with her ghost or vision from the past. The poem "Agnes" by Adam Gottlob Oehlenschlager is essentially the same story with some minor differences, Agnes stays underwater 8 years and bears 7 children instead of two; she does not encounter her parents' funerals or tombstones but seems to die randomly after returning to the surface. There were different versions of this old Danish ballad floating around, even Andersen himself had written a version of Agnete and Merman earlier in his life. Another mermaid story, "The Mermaid's Prophecy," illustrates a mermaid that was captured by the King and Queen to tell their fortune. Unfortunately for the Royal couple, the Queen's death is predicted. It seems that a vast majority of folk mermaid tales are tragic. In romances, they center on lovers from two different worlds, and whether the maiden was originally human or from the sea (as in selkie stories), whether she actually loves her husband from a new land or not, she tends to inevitably feel the pull back to her original home. Other non-romance tales focus on the supernatural abilities of mermaids. Not all of these are tragic-there is a humorous tale from Denmark called "Hans, the Mermaid's Son." The offspring of a mermaid with a human has super strength and ventures onto land to find work. He is disliked for his odd ways and how effortly he shows up the workers around him; his boss keeps trying to kill him off. Yet the mermaid's son is ignorant of all these attempts to hurt or kill him; he is so strong he is practically immune to their tricks. The story is similar to many fairy tales of the simple, yet kind-hearted fool who ends up victorious-in the end he makes sure everyone around him has plenty of riches, and being tired of living among mortals, goes back to the sea. When you compare these and other mermaid tales to "Little Mermaid" and the other literary tales of the time, you notice that the mermaids of lore who are so otherwordly and powerful have been reduced to foolishly lovesick teenagers. Yet while many see this as mysoginist, Andersen himself identified with the Little Mermaid, as have many others, male and female (such as Zemlinsky the composer), who experienced non-requited love. While most people today are shocked at the tragic ending, that part is actually the most consistent with traditional mermaid tales. I had almost missed this post over on Surlalune, so make sure you read it if you haven't already: the fairy tale community responded to Richard Dawkins' statement that fairy tales could be detrimental to children. Hop on over to the post to read more about what he actually said (and his later amendment), and the fairy tale defenders discussing their worth-all very interesting stuff. I've partly addressed the possible benefit of fairy tales/fantasy before, even from an intellectual perspective, in my post on what Einstein may have meant when he (supposedly) said "If you want your children to be intelligent, read them fairy tales. If you want them to be more intelligent, read them more fairy tales." I just find it interesting that Dawkins assumed that children who read fairy tales automatically believe in them. I never believed fairy tales were true, what's more is in all my interactions with children I feel like I've never had to have a discussion with them about what's possible and impossible-they get that a pumpkin turning into a coach and fairies granting wishes is magic. I do think that, possibly, the difference between most children and most adults interacting with fairy tales is that children tend to want the fairy tales/magic to be true, but they can also be pretty shrewd/skeptical. We shouldn't underestimate children and their potential. Furthermore, to equate fairy tales with Santa and with God is just illogical. Santa is a cultural myth-many parents go to great lengths to convince their kids that Santa is real, and when we throw in movies and mall Santas it's a completely different story than we have with fairy tales-except in rare cases no one is actively trying to provide their kids "proof" that Cinderella was at the ball or Snow White bit the apple. And God is a whole other matter. You can find very intelligent scientists who believe in God or the possibility of God, bu you won't find any who believe in Santa Claus. Plus, Dawkins seems to assume that anyone unveiling the "truth" about childhood beliefs will be damaged by that. I personally think that, when I read tales of magic and wonder, it often helps me appreciate the beauty and wonder of creation. I also talked a little about this in my post on Mermaid hoaxes. Anyway, I'm curious as to how you all reacted with fairy tales when you were little. Did you/anyone in your acquaintance believe in fairies? Was there a moment of discovering the "truth" that affected you in any way? People are still intrigued by the history of Maleficent, (which is wonderful!) and I myself was curious after reading more reviews about where the whole idea of an offended, uninvited fairy from Sleeping Beauty came from. It's frankly one of the reasons that Sleeping Beauty seems, to me, to be less powerful than the similar Snow White; the struggle for women who are told by culture and/or by specific people in their lives that their worth is due mainly to their beauty and sexual allure is something very prevalent for women today as well, and why I think it's important to ponder the witch's question to the mirror on the wall and the implications it carries for us today. In comparison, the evil fairy in Sleeping Beauty seems petty, and the only conflict seems boiled down to etiquette. Most older Sleeping Beauty tales did not have a slighted fairy who was not invited to a party; the Princess' fate was foretold but she was not spitefully cursed. It wasn't until Perrault's tale that the motif became associated with the tale. Perrault came from a world of class distinctions and court manners. In many cases he poked fun at the aristocracy in his tales. Given his propensity for satire, I wouldn't be surprised if he didn't mean for the fairy's motivation to be taken so seriously. "The uninvited fairy motif goes back to Greek mythology when he goddess Eris is not invited to a wedding, but arrives anyway, and throws the Golden Apple of Discord amongst the other goddesses with the inscription ‘For the Fairest’ which causes an argument over whom should claim it, and leads to the Trojan War." in "chanson de geste Les Prouesses et faitz du noble Huon de Bordeaux: the elf-king Oberon appears only dwarfish in height, and explains to Huon that an angry fairy cursed him to that size at his christening." Yet these instances aren't from Sleeping Beauty tales. In one variant, The Glass Coffin, the curse was given by a traveler who was offended when the beautiful girl wouldn't marry him. And despite its likely tongue-in-cheek flavor from Perrault, the idea of being rejected by society or left out by your friends is still not something to take lightly. What comes to your mind when you read the episode of the uninvited fairy? 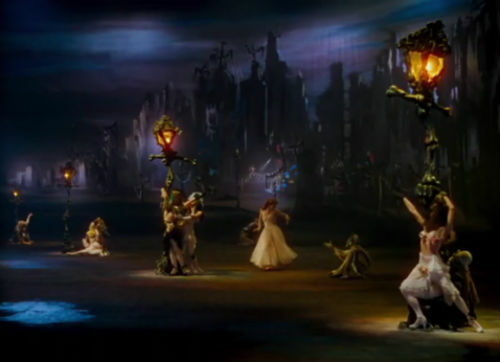 In my last post I discussed the Andersen fairy tale The Red Shoes, which has since been made into a ballet film. From 1948, it still has many fans and was a groundbreaking movie at the time. From a fairy tale perspective, I think it's very interesting how the focus of the tale shifted from Andersen to Hollywood. Andersen's tale is clearly a morality story, cautioning young girls against disobedience, especially in the form of vanity; with the only cure being extreme piety. When you transport the story into the ballet world, the emphasis on vanity almost becomes obsolete. The whole dance form is very unnatural and painful-to move in your legs in perfect turnout and dance on the tips of your toes is counter intuitive and requires years of disciplined training (and often bloody feet, which also hearkens back to several fairy tales). Yet this is also why ballet is so fascinating to watch, and why it goes perfectly with fantasy and fairy tale stories; the dancers really do appear otherworldly and fairy-like. In a world of painful shoes and impractical tutus, condemning a pair of shoes for being a certain color is hardly relevant. 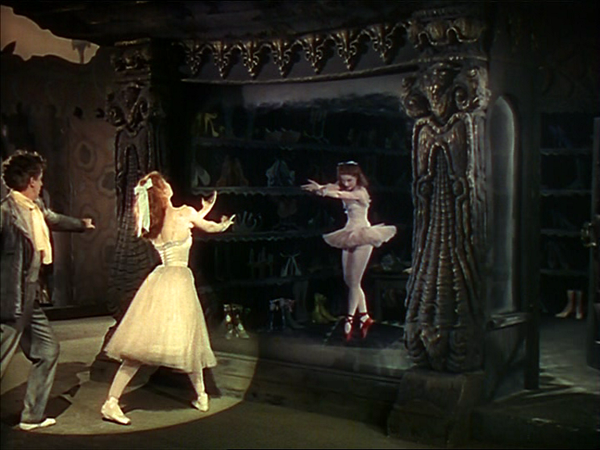 The film centers around a dancer, Vicky, who is cast as the lead in a ballet based on the fairy tale "The Red Shoes." The summary from Imdb: Under the authoritarian rule of charismatic ballet impressario Boris Lermontov, his proteges realize the full promise of their talents, but at a price: utter devotion to their art and complete loyalty to Lermontov himself. Under his near-obsessive guidance, young ballerina Victoria Page is poised for superstardom, but earns Lermontov's scorn when she falls in love with Julian Craster, composer of "The Red Shoes," the ballet Lermontov is staging to showcase her talents. Vicky leaves the company and marries Craster, but still finds herself torn between Lermontov's demands and those of her heart. Thus the conflict has gone from obedience/humility vs. vanity, to love vs. career. This dilemma is one that many modern people can relate to, and is also especially true of ballet, which is such a demanding career. But the image of a pair of shoes that has a mind of its own, that is dangerous and can lead someone down a path that can destroy their life, is still present in both stories. Yet I think audiences of the movie tend to see the conflicts less of something that was Vicky's fault, and more of her being caught in a very difficult situation. 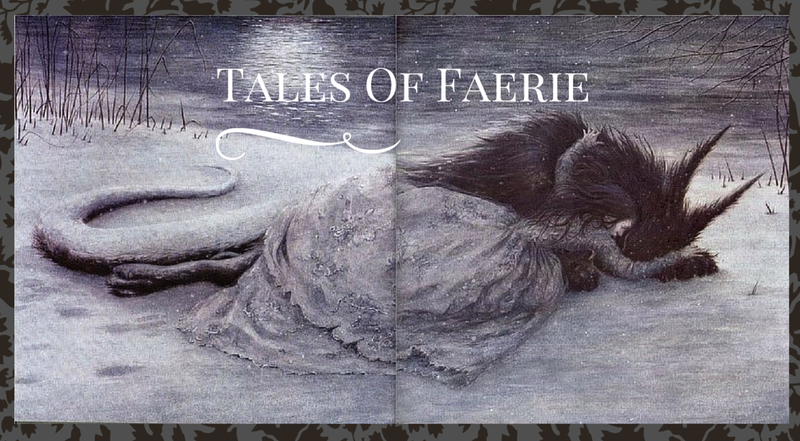 We are intrigued by the creepy idea of shoes with a death wish, and so the fairy tale lives on, yet now in a story more appropriate for a culture that seeks a different form of morality. Keeping the story and ballet relevent to more current audiences, the ballet was featured throughout season 2 of the Australian ballet t.v. show Dance Academy (available on Netflix Instant Play! In case you can't tell this is pretty much where I get all of my entertainment). As the main character preps the solo for an audition, we are told that what sets this excerpt apart from others is the need for the dancer to have emotional maturity-she needs to portray real grief as well as good technique. I'm not sure what real dancers think of this solo-is it really challenging? Do you really have to have more grief than most other solos? Many ballets have tragic storylines so I suspect this was something overemphasized for the sake of the show. However, it did bring the story to light for a new generation, as the fairy tale keeps being reimagined for an ever changing world. Also, has anyone seen the 2005 Korean Red Shoes film? It has pretty good reviews but also seems REALLY dark. "The Red Shoes" is a tale by Hans Christian Andersen, one that really reveals his tendency to condemn a young girl, in this case for her vanity, and make her suffer incredible punishments that seem to far outweigh the crime. Karen, the protagonist, struggles with vanity long before she even comes into contact with the fateful shoes. "People said that she was pretty. But the mirror told her, 'you are more than pretty-you are beautiful.' 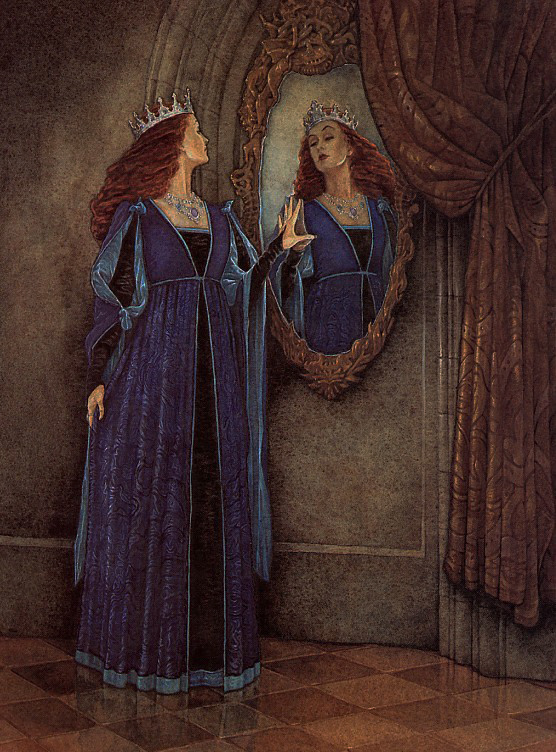 " A throwback to Snow White's evil Queen, perhaps, another vain character known to listen to her mirror? Karen chooses red shoes for her confirmation, causing everyone to stare at her shoes the whole time. She continues to wear them, despite how "improper" they are to wear to church. She is no longer able to focus, but thinks of her shoes the whole time-"she forgot to say the Psalm, forgot to say the Lord's Prayer." She even passes a funeral for herself, and knows "she was forsaken by everyone and damned by the angel of God." Nothing can help her until she goes to the executioner and asks him to chop off her feet. Even the first time she tried to go to church again, the red shoes were still there, dancing on their own, and she had to repent of her sin. After that she became the image of piety, "industrious and thoughtful," and when children "asked her about dress and grandeur and beauty she would shake her head." After living in humble piety for a while with her crutches, one day she is taken up to Heaven, "and no one was there who asked after the Red Shoes." (Italics part of the story, not my emphasis). All that for a pair of shoes seems rather extreme, but wikipedia includes this pertinent background information: "Andersen explained the origins of the story in an incident he witnessed as a small child. By his report, his father was sent a piece of red silk by a rich lady customer, to make a pair of dancing slippers for her daughter. Using red leather along with the silk, he worked very carefully on the shoes, only to have the rich lady tell him they were trash. She said he had done nothing but spoil her silk. "In that case," he said, "I may as well spoil my leather too," and he cut up the shoes in front of her." So Andersen may have had bitterness towards the rich more than towards women and girls especially. She originally wants red shoes because she sees a princess wearing them. This paper by Anastasia Yuanita sees the story as cautioning children more about obedience than vanity. Karen tricked her adopted mother into buying her red shoes, and wore them over and over again after being told not to. As far as we know, the princess in the beginning was never condemned for wearing her red shoes, so her sin could be idolizing the shoes more so than just wanting and wearing the shoes in and of themselves, good news for any of us who happen to own red shoes. Plus, extremely didactic tales enforcing children's obedience were pretty much the norm at the time. However, when you look at this story in combination with Andersen's others, you really do start to notice a pattern. Inger of "The Girl Who Trod on a Loaf" is given even more dire punishment. This girl is bad, cruel, and proud-even despite her poverty. In her vanity and foolishness, she uses a loaf of bread given to her to place in the mud to keep her shoes from getting dirty. For this she becomes a statue in the underworld, forced to hear the voices of people up above telling her tale as a warning against wickedness, and she wishes she had never been born, and that people had punished her more for her waywardness. I couldn't help but wonder how much of Andersen's attitude towards red shoes were universal, and how much was his own, so I did a little digging. From BBC News: "In the 1670s, Louis XIV issued an edict that only members of his court were allowed to wear red heels. In theory, all anyone in French society had to do to check whether someone was in favour with the king was to glance downwards. In practice, unauthorised, imitation heels were available." This lecture tells us that "woman in red" was basically a code name for "prostitute" in England and France in the nineteenth century. Prostitutes could also be identified simply from their dress-being overdressed according to cultural wardrobe norms. Yet, red shoes couldn't have been a universal symbol for wanton sexuality, especially (one would assume) if there were pairs available for little girls. 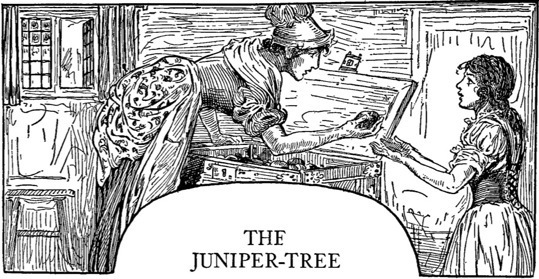 Plus, in the Grimm's The Juniper Tree, when the brother is resurrected as a bird, he rewards his sister Marlene by bringing her a pair of red shoes from the shoemaker. Marlene is only represented as good and kind, and was thankful for the present. 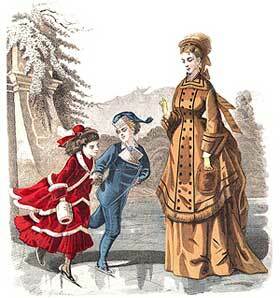 In fact, I'm finding it difficult to research the importance of red shoes in nineteenth century Europe. It seems shoes of many different colors were fairly common, especially by the mid-1800s. 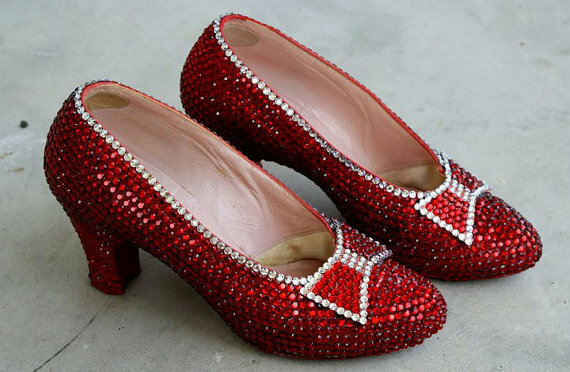 There are so many other fairy tales that deal with shoes in general, so I tried to keep this post limited to discussion of red shoes specifically (although you could also throw in the stepsisters from Cinderella-after putting their mutilated feet into Cinderella's slipper the trickling red blood is what tipped the Prince off to their deception). 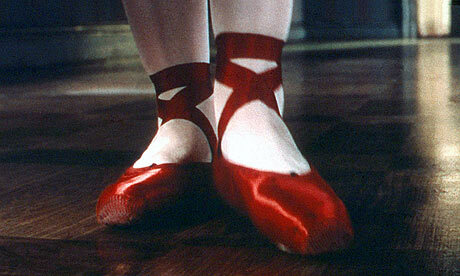 Any thoughts on the symbolism of red shoes in fairy tales, and/or historical facts about red shoes? You may have heard some news from a while back that a U.S. school banned "Little Red Riding Hood" because of the use of alcohol (in that it shows Red bringing wine to her grandmother). Apparently Sleeping Beauty has been banned at some point as well, for "promoting witchcraft and magic", and entire copies of Grimm's Fairy Tales as well. "Every man, they said, must face reality. Must face the Here and Now! Everything that was not so must go. All the beautiful literary lies and flights of fancy must be shot in mid-air! So they lined them up against a library wall one Sunday morning thirty years ago, in 2006; they lined them up, St. Nicholas and the Headless Horseman and Snow White and Rumpelstiltskin and Mother Goose-oh, what a wailing!-and shot them down, and burned the paper castles and the fairy frogs and old kings and the people who lived happily ever after (for of course it was a fact that nobody lived happily ever after! ), and Once Upon a Time became No More! And they spread the ashes of the Phantom Rickshaw with the rubble of the Land of Oz; they filleted the bones of Glinda the Good and Ozma and shattered Polychrome in a spectroscope and served Jack Pumpkinhead with meringue at the Biologist's Ball! The Beanstalk died in a bramble of red tape! Sleeping Beauty awoke at the kiss of a scientist and expired at the fatal puncture of his syringe. And they made Alice drink something from a bottle which reduced her to a size where she could no longer cry 'Curiouser and curiouser', and they gave the Looking Glass one hammer blow to smash it and every Red King and Oyster away!" 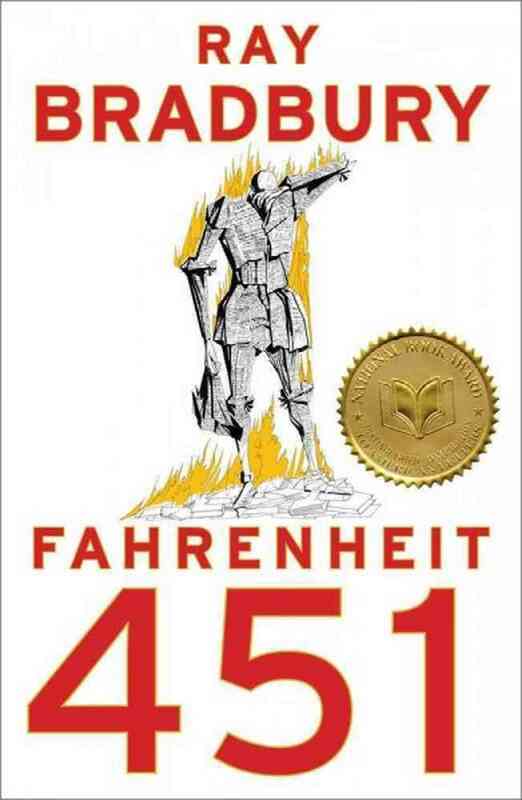 I just find it interesting that this story deals with the banning of all books, not just fairy tales, but how Bradbury alludes so heavily to fairy tales and classic fantasy with all of his examples, when he could have mentioned any of the other wonderful, world-renowned works of literature that exist out there. In general, we don't really have to worry too much about books being banned, thankfully. Even if a few schools or libraries ban certain books, there are plenty of other ways to get your hands on the same book, and frankly it probably just increases a student's desire to read the forbidden fruit. Image supposedly from this page although I don't see it?? Yet remember that some forms of banning do occur, even supported by fairy tale lovers, and not without reason. You have to consider age and maturity appropriateness, as many fairy tales really can get quite dark. Many feminists would argue that we shouldn't tell our children the old fashioned versions of fairy tales in which the women are passive victims, in need of rescue by a man. Clarissa Pinkola Estes thinks we should keep anti-Semitic fairy tales out of copies of Grimms, except for those being used for research purposes. But of course, there's so much room for debate. I completely agree that women should have equal rights and that repeated exposure to a certain stereotype can be damaging even at a subconscious level, and I absolutely believe that racism in any form is wrong. But many fairy tales were meant to be shocking because they were meant to get a point across-to be a voice for the voiceless. And we have to remember fairy tales are also products of history, from times when racism and chauvinism were rampant. It SHOULD be horrifying to imagine a father giving away his daughter to an animal in marriage, as in many Animal Bridegroom tales-because that's how many young girls saw their older, unwanted future husbands. The depths to which Hansel and Gretel's parents sank reflect the poverty many families endured. The "moral" of Bluebeard tells us just how ingrained in people's minds gender bias was. And as horrible as racism is, we can't pretend it didn't exist. Through seeing how dangerous and extreme it can get, it helps us to fight the racism that still exists today. Again, it's a complicated issue and you have to use good judgement, but many controversial fairy tales can serve as a starting point for honest conversation for children who are ready to think about different issues maturely. And here's the thing about fairy tales-even if we were to, in the future, become part of a society like Bradbury imagines in which books are banned, fairy tales are extremely resilient. For generations and generations they were passed down by word of mouth, and they are pretty much the only genre to have survived hundreds and hundreds of years in some form and yet still remain known and well-loved by the public (I think religious texts would be the only other thing to fit in this category?). 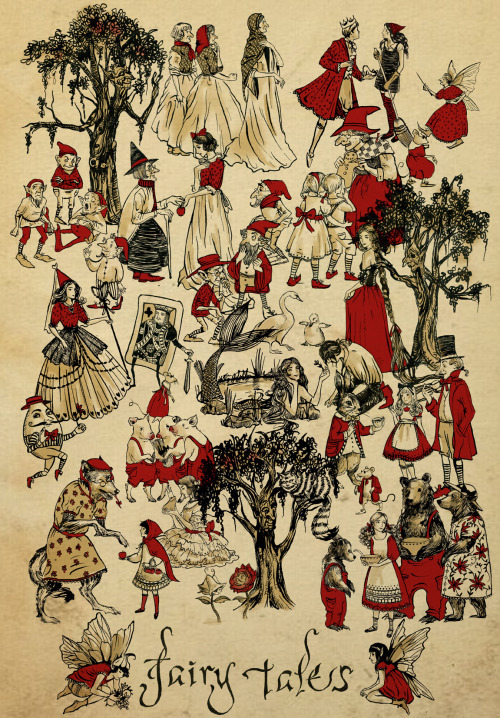 Fairy tales have already survived, despite being looked down on by the upper class in certain cultures, and relegated to the nursery in others, and are clearly not going anywhere.